The band shell at New Rochelle’s historic Hudson Park will once again be filled with the “sound of music” as the New Rochelle Council on the Arts presents its annual summer concert series from June 27th through August 31st. The Emil Paolucci Summer Sounds Concert Series, created by the New Rochelle Council on the Arts, is in its 11th season and this year’s concerts will feature an eclectic menu of musicians. On Wednesday, July 25th Forever Ray takes the stage. 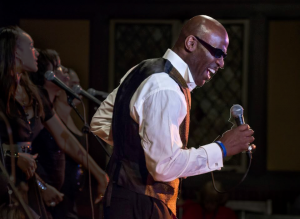 This tribute band performs the exciting and uplifting music of Ray Charles – a wonderful blend of styles ranging from jazz and blues to country and R&B.